On December 5th the streets of Prague will be overtaken by colourful, costumed trios made up of Svaty Mikuláš, Čert and Anděl (St Nicholas, the Devil and Angel). Why, you may ask? Well the simple answer is that they are seeking out kids to find if they have been naughty or nice! This historical Czech tradition is impatiently awaited by all children and you can find out more about it by clicking through. This you will not find in any other country. 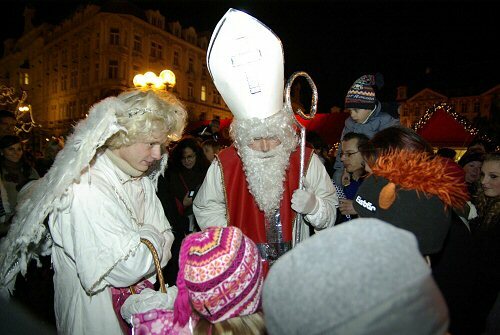 You can invite St.Nicolas with Devils to your home or you can join many St. Nicolas Events around Prague. In community centres, Shopping Malls, Indoor Playgrounds or at Brunches. Show by famous Czech presenter folowed by Mikulas with Devils visit. Come to Dvorakovo nabrezi (bank) and board onto a boat of: the “Classic River” boat taking you around romantic Prague by night. Mikulas will be on board with Angel and Devil. Kids program the whole time and mini-disco. Hot and cold buffet. The program will be run in Czech but Mikulas is English speaking so parents and children will be able to talk with him. Prices: Adults: 270 Czk, Kids 220 Czk. Family tickets available. Rich programe, competitions with Angels, visit to the ancient cellar of the building, mini-disco with Angels, crafts, present for every child from Mikulas, facepainting. St. Nicolas MENU: Potato soup, roasted chicken with potato mash and Angel. All this for 100 CZK. 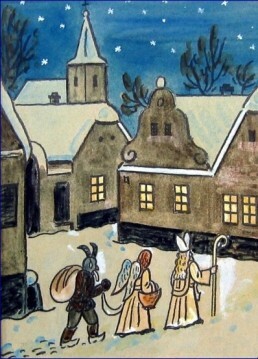 Mikulas (St. Nicolas) will meet Kids in between 13:00 - 14:00 in small “obora” scene. At 12:00 Kids Play. 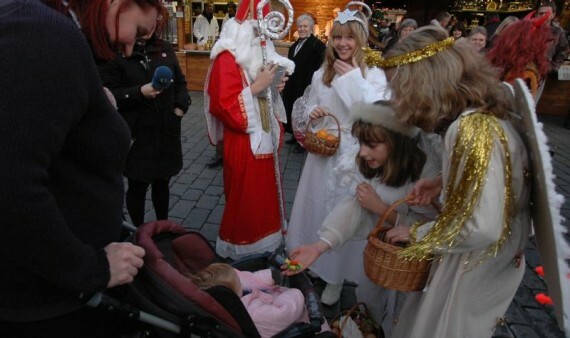 Face painting, dancing with Angels, competitions, visit of Mikulas giving presents to all Kids. Wheel of fortune with prizes for Kids. Event is free. This tradition is common to many European countries and goes back to Medieval Europe, when the local priest would be informed about children’s behaviour by their parents and then would visit children in their homes to either give praise or to reprimand. So these days when St Nick comes calling, if children have been good, they will receive sweets and other goodies but those who have been naughty and disobedient are handed potatoes or coal from the devil instead. The modern-day Santa Claus in Anglo-Saxon countries, was in fact derived from St. Nicholas himself. As tradition dictates, St. Nicholas will be asking each and every child if they have been good during the past year. If the kids are not too frightened they usually say yes and they sing a song or recite a short poem they have prepared especially for Mikulas. For this they will be rewarded with sweets and other treats. Usually the parents prepare a list with things their kid did wrong and right. Mikulas reads out each of them one by one asking the kid if it is truth. The children truly believe that Mikulas has been writing all these things in his book throughout the year - because he can see everything. At least all the parents say so…. Naughty children don’t get anything, instead of that they get a sack of black coal or hard potatoes. As mentioned - my parents were once so cruel to give me black coal instead of the treats. I must admit it has left me with a deep scar on my personality! The naughtiest of the naughties are promised to be placed in the Devil’s sack and sent to hell! Very often the devil caries a broom stick in his hand and the naughty kids get few smacks on their bums. It is symbolic, don’t worry! The way I remember St. Nicolas Day from my childhood is, we would gather several families in one of the households. Fathers or family friends would dress up as the Mikulas Crew and would come to distribute the presents and talk to the kids. Funny enough for long time I thought Mikulas (St. Nicolas) was real. That’s how good my uncle was. This is the way its being done in the present as well. The families who have no-one to join or don’t have time usually pay for student groups offering their services as Mikulas crew all over the town. You may have noticed their leaflets strapped to trees and posts in your neighborhood with tear off phone numbers to call them on. You just book the time of their visit, give them presents for kids in the corridor and let them do the job. For this they usually take around 500czk per visit. There is always the option to choose this special evening to visit your local Christmas Market or the large Christmas Market in Starometske Namesti (Old Town Square). The Markets are at their most liveliest on this magical evening - you can browse the stores and choose gifts while indulging in hot Svarak (mulled wine), roasted chesnuts and corn-on-the-cob. You can also admire the Christmas Tree covered in lights and maybe even listen to some Carol Singers. But best of all is watching the bizarre but fabulous parade of Devils, Saints and Angels racing off to various homes for pre-arranged visits to families with kids!